One of the most effective ways to encourage wildlife into your garden is by introducing a pond. Not only will birds enjoy a place to bathe, insects such as dragonflies and pond skaters will flock from all around to enjoy a sunny, damp area. You might even spot frogs and other amphibians around your garden once your water plants have a chance to take root and your pond becomes a natural wildlife haven. This guide will show you how to build a pond which your local wildlife will thank you for! Late winter is the best time of year to build a pond, as it will establish itself more quickly. Set aside a week, or two or three weekends to make sure you have enough time to complete your project without. You should build your pond in the sunniest part of your garden, to encourage warmth-loving insects and other creatures. Ideally, it will be away from tall trees which will shed their leaves in autumn, although you can always clear these leaves manually if necessary. Mark out the rough shape and size of your pond using string. Grab your spade and start digging out your pond. Begin by digging the whole pond around 2 feet deep. In the centre, dig down an extra foot, creating a depth of 3ft at the pond’s deepest point. When digging, aim to keep the pond’s undisturbed so the soil remains compact, which will help the pond to maintain its shape. At one end of the pond, create a shallow slope, which will help creatures to climb out of the water more easily. Keep any loose, dug up soil in a tub or wheelbarrow for use later. Varying your pond’s depth and creating underwater “shelves” will help to make the pond accessible for all different kinds of wildlife and plants, and making it sufficiently deep ensures that waterborne creatures aren’t harmed when the surface of the pond freezes in winter. Before adding your pond liner, rake the inside of your pond thoroughly to remove any sharp stones which could pierce holes in it. 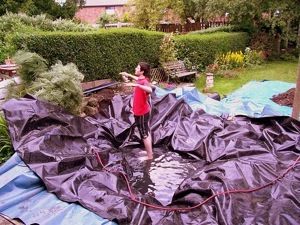 Pond underlay and liners can be purchased from most DIY shops and garden centres. Pick a calm day and enlist the help of a couple of friends, then spread the liner over the pond leaving a generous amount around the edge. Add the water (preferably harvested rainwater, if not, tap water will work) using a garden hose, pushing the liner into the corners of the pond. Add large rocks to keep the liner in place if needed, and try to keep folds and creases in the liner to a minimum. Now the basic pond is in place, you can start neatening it up to make it more a part of the landscape. Use strong scissors or a sharp knife to cut away any excess liner, leaving a foot of liner around the pond’s diameter. Inspect the edges, and fill in any gaps which may have formed between the liner and the ground, using the spare soil. When the pond and liner appear neat and solid, use the remaining soil to cover the edge of the liner. The soil can also be used to create further shallow slopes into the pond to allow more exit points for wildlife. Don’t worry about how muddy it looks, it’ll soon settle! Now that the edge is covered, place a series of large rocks around the edge to keep the liner and soil in place, as well as forming shelter for frogs and insects. If you’ve filled your pond with harvested rainwater, it should be ready for plants to be added within a couple of days, once the sediment has settled. If you’ve used tap water, leave the pond to stand for a week to allow the chlorine levels in the water to fall. Don’t worry about planting too neatly, wildlife prefer their habitats to be a little chaotic, and are happy with the extra shelter that overgrown, moist conditions provide. Once your plants have been added, you can watch your pond develop, with the water quickly changing from bright green to crystal clear as the plants get settled and start to oxygenate their watery conditions. Now your pond has been built and filled with plants, you can start to enjoy it and the wildlife it attracts, and you should soon see beetles, dragonflies, newts and frogs inhabiting the water. To keep their conditions ideal, prevent plants and algae from becoming too dense and “choking” the pond of air. 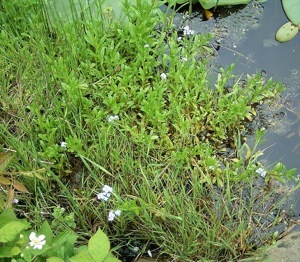 If the pond develops algae, pull up some of the excess plants. This keeps nitrogen levels to a minimum and starves the algae spores of the food they live on. In a similar way, plants themselves can be problematic when they become overgrown, so don’t be afraid to pull them up from time to time, to keep them under control. You may occasionally have to remove other debris from the pond, in particular, fallen autumn leaves. While some of these can be left to provide shelter for frogs and insects, they should be removed from the pond’s surface to avoid starving it of oxygen. Anything that is pulled from the pond can be added to your compost heap to avoid waste and feed other parts of your garden in the coming year.